Postmates is an on-demand delivery platform that delivers anything from burritos to iPhones. Founded in 2011, Postmates has operations in close to 385 cities and is within reach of 135 million people, which is almost half the U.S. population. They even started their global footprint by expanding to Mexico. 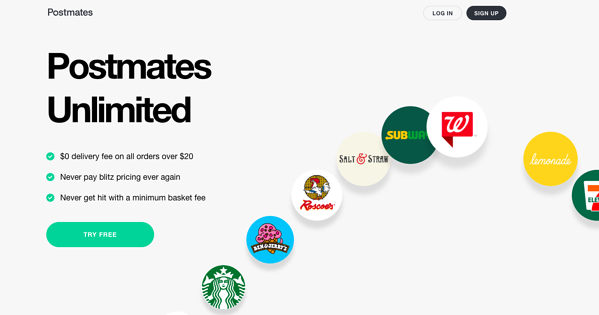 Recently, they launched an Amazon Prime-esque loyalty program called “Postmates Unlimited,” offering free delivery for all orders above $20. It's a revolutionary step for any logistics company. But are they making the most of all the hype? 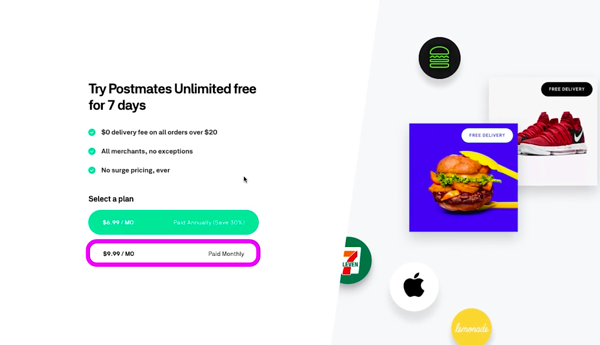 In this week's Pricing Page Teardown, we analyzed a few loopholes in Postmates' pricing strategy. We found that a small tweak in their annual plans can amount to insane returns. We also bumped into the number-one mistake that most SaaS companies make. In an attempt to satisfy the whole market with a simple one-tiered pricing plan, they are actually losing out on an entire section of that market, a section that is willing to pay a lot higher. But where is the pricing? Now isn't this a bit shady? Is it ethical to hide the pricing before customers sign up? This is a debatable topic. Most B2C companies generate leads by grabbing email IDs of site visitors even if they don't want anything. The strategy is to email them until they are ready to hit the “unsubscribe” button or until they actually need the service. Hiding the pricing usually comes under this strategy. But in Postmates' defense, confusing visitors early on with pricing can also be counterproductive for SaaS companies if visitors don't even know what the service is all about. It's better to let them try your service first and then explain the costs involved. Postmates Unlimited just has one tier in their pricing plan. The monthly plan is $9.99 and the annual plan is $6.99/month, which is about $84 per year. When you look at monthly willingness to pay, they've got it just right. By charging $9.99, they are right in the average zone. They can capture a large portion of the market at this price point. 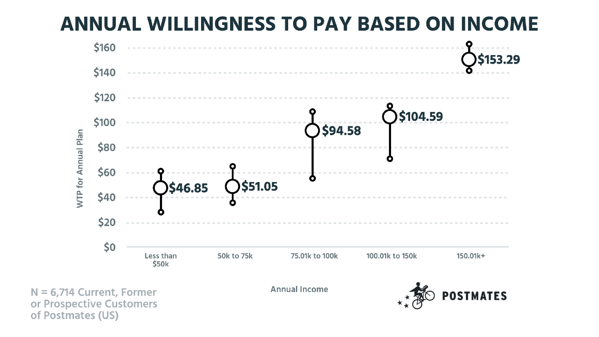 Our data from 6,714 Postmates' customers shows that they can raise the price to $100 per year and easily capture the higher income brackets. In the monthly willingness to pay, the delta between each income bracket is small, so averaging is less of an issue. 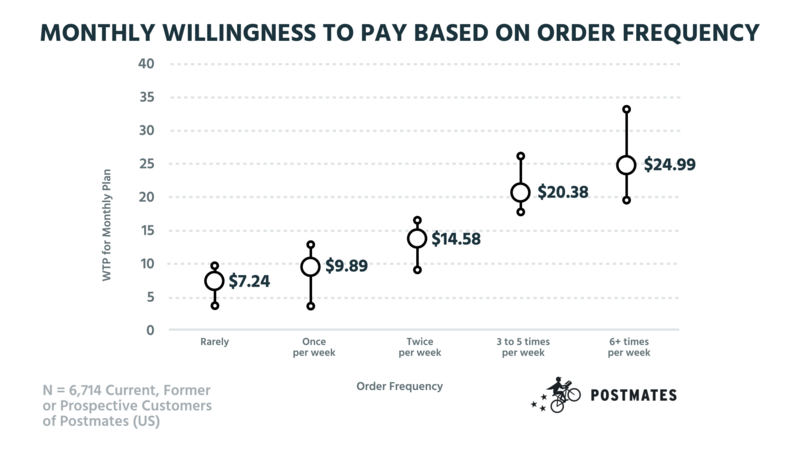 With this annual willingness to pay, the spread is far larger, meaning the average is dragging down the price opportunity for Postmates. At $100, Postmates is still offering a discount from the monthly plan, but getting $16 more per user. Another way to improve their conversions is a minor tweak in the value proposition. Instead of using percentage discounts in their copy, they should make it look like customers are getting a couple of months free. This is much more valuable for the human psyche! "When you are using your annual discount, giving someone two months, like saying “Hey, you get two months free!” which effectively will be a hundred dollars here, is so much more effective than giving something like 33% off, because as human beings we don't understand basic percentages." It's also obvious that people who order a lot are willing to pay much more. 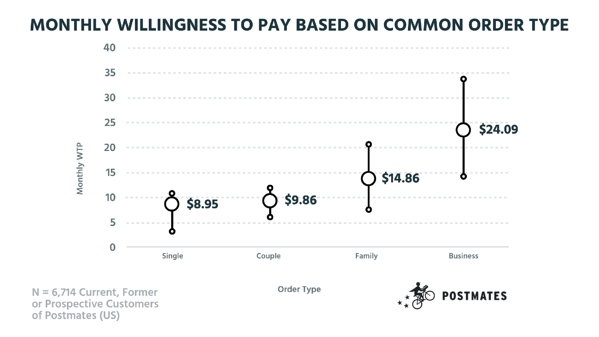 But looking at the stats, we see that it is far more than Postmates is charging. 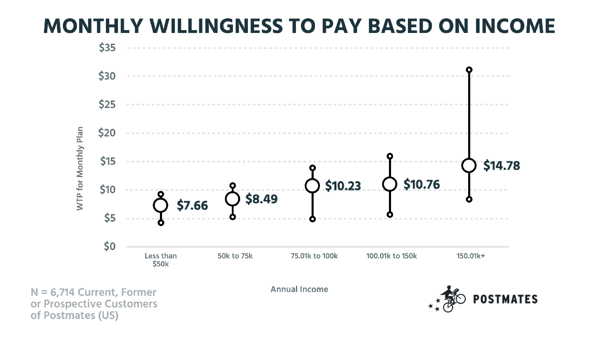 Even people who order less than once a week are willing to shell out $7.24 a month. Their single plan pricing is dedicated to the people who find the least value in the product. With this pricing structure, Postmates is neglecting a huge potential for revenue growth. “No surge pricing” is something they are already offering in their current plan. However, being a High Value/Low WTP service, it's something that people expect as opposed to being a USP. 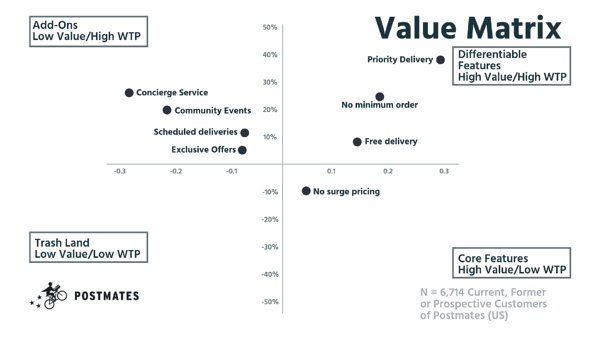 We found that “Priority Delivery” is a golden feature that many are willing to pay for. "A few months ago, we would wait an hour to get Postmates to approve our order or whatever it ended up being. But if you give me priority delivery, I'd probably be willing to pay more if my frequency of orders continues to play out." This would be a great deal for premium customers. As part of the plan, they can also add on “exclusive offers,” “scheduled deliveries” and “access to community events” to push people with less WTP to this higher tier. This will actually spur more orders and thus more net revenue. Is Postmates growing because of their low pricing? Postmates is projected to hit $400 million in revenue by the end of 2018, which is great. But when the competition is high, even big companies can get into a negative mindset where they feel they're growing because of their low pricing. What they do not understand is that there are a lot of people in the market willing to spend much more. Pricing your service to satisfy the whole market is a loophole that can be exploited by competitors as it leaves a lot of demographics unattended. On the flip side, it's very interesting to see that they can actually make a lot more than their current revenue estimate just by making these minor adjustments! So do you want to win a year of Postmates Unlimited? Just share this on Twitter, Facebook and LinkedIn using this hashtag #PPT and tag us at @priceintel or @priceintelligently.